The paper concerns the modified Gran methods, designed for determination of equivalence volume (Veq) and the slope (J) value of a redox indicator electrode (RIE) applied for potentiometric titrations in redox systems. The methods are exemplified by the titration of (1o) FeSO4 and (2o) FeSO4 + Fe2(SO4)3 mixture with KMnO4 or Ce(SO4)2 solution as titrant. The modified Gran methods are based on detailed conclusions resulting from thermodynamic modelling of the related systems according to GATES/GEB principles. Keywords: Redox titration; GATES/GEB; modified Gran methods; electrode calibration. Notations and acronyms: D – titrand (solution titrated); E – voltage [V]; GATES – Generalized approach to electrolytic systems; GEB – Generalized electron balance; LSM – least squares method; T – titrant; V0 – volume [mL] of D; V – volume of T added into D from the start up to a given point of titration: T(V) ⟹ D(V0). The original versions of the Gran I [1,2] and Gran II [3,4] methods, denoted later as G(I) and G(II) methods (for brevity), were designed for evaluation of equivalence volume (Veq) in potentiometric titrations, based on transformation of fragments of S-shaped titration curve into linear segments. Both methods, of extrapolative nature (extrapolative standard addition method), especially G(II) method, were widely exploited later in practice by chemists-analysts. The progress in applications of the G(I) and G(II) methods for analytical purposes was not uniform when referred to the main areas of titrimetric analyses, i.e., acid-base, redox, complexation and precipitation titrations. The methods were devoted mainly to acid-base titration, with special emphasis put on alkalinity. As refers to redox systems, only a few papers of other authors were issued hitherto; all them were based on primitive models resulting from stoichiometry of redox reactions, where only the species entering the redox reaction notation were involved, see e.g. . The functional dependencies based on those assumptions, gave erroneous experimental results for Veq, as were stated in [6-8], and confirmed later in the papers [9-12]. where C, C1, C2 and C02, C03, C04, C05 are concentrations [mol/L] of the corresponding solutes in T and D, respectively, completed by water. From formal viewpoint, the System I can be considered as a particular case of the System II, at C03 = 0. Some similarities inherent in the balances will be applied for further presentation of the balances in a compact form. The detailed considerations regarding the modified Gran methods will be preceded by formulation of the Generalized Electron Balance (GEB) for the Systems II and III, according to the Approach II to GEB. The algebraic equivalency of Approaches I and II to GEB will also be proved. The terms: components of the system and species in the system are distinguished. After mixing the components (solvent + solutes), a mixture of defined species is formed. We refer here to aqueous electrolytic systems, where the species exist as hydrates , i=1,…, I; zi = 0, ±1, ±2,…is a charge, expressed in elementary charge units, e = F/NA (F = 96485 C∙mol−1 – Faraday’s constant, NA = 6.022∙1023 mol-1 – Avogadro’s number), ni = niW = niH2O ≥ 0 is a mean number of water (W=H2O) molecules attached to ; the case niW=0 is then also admitted. For some reasons, it is justifiable to start the balancing from the numbers of particular entities: N0j – for components (j = 1,…,J) represented by molecules, and Ni – for the species (ions and molecules) of i-th kind (i = 1,…,I). The mono- or two-phase electrolytic system thus obtained involves N1 molecules of H2O and Ni species of i-th kind, (i=2, 3,…,I), specified briefly as (Ni, ni), where ni ≡ niW ≡ niH2O. For ordering purposes, we write: H+1 (N2, n2), OH-1 (N3, n3),…, where z2 = 1, z3 = –1,… . (II.2) D(V0) subsystem, composed of FeSO4∙7H2O (N04) + Fe2(SO4)3·xH2O (N05) + H2SO4 (N06) + H2O (N07) + CO2 (N08). For I.2, we have N05 = 0 in the D(V0) subsystem. (III.2) D(V0) subsystem, composed of FeSO4∙7H2O (N05) + H2SO4 (N06) + H2O (N07) + CO2 (N08). CeOH+2 (N34, n34), CeSO4+1 (N35, n35), Ce(SO4)2-1 (N36, n36), Ce(SO4)3-3 (N37, n37). The species, with the related ordinal numbers, will be applied in the balances, formulated below. Molar concentrations [mol/L] of the species are denoted as , for brevity. The presence of carbonate species is considered here as an effect of CO2 from air, as the admixture of ‘pure’ water used on the step of D and T preparation; it may imitate the real conditions of the analysis, realised according to titrimetric mode. The T and D can be considered as static (sub)systems of the dynamic D+T system realised in the titration T(V) ⟹ D(V­0­), where V mL of T is added into V0 mL of D, up to a defined point of the titration, and V0+V mL of D+T mixture is obtained at this point, if the additivity of the volumes is valid/tolerable. The D+T mixture is homogenized after each (small) consecutive portion of T added into D, to imitate the titration as the quasistatic process realised in a closed system, under isothermal conditions, pre-assumed for modelling purposes. In aqueous media, we formulate charge balance, f0 = ChB, and elemental balances: f1 = f(H) for E1 = H (hydrogen) and f2 = f(O) for E2 = O (oxygen),… ; other elemental or core balances are denoted as fk = f(Yk), Yk = Ek or corek (k=3,…,K). A core is considered as a cluster of different atoms with defined composition (expressed by chemical formula), structure and external charge, unchanged in the system in question; e.g., SO4-2 is a core within the set of sulfate species: HSO4-1∙n4H2O, SO4-2 ∙n5H2O, FeSO4∙n11H2O in the (I.2) D(V0) subsystem. In order to formulate the reliable (formally correct) set of balances for a given system, it is necessary to collect detailed, possibly complete (qualitative and quantitative) information regarding this system. The qualitative information concerns the components that make up the given system, and the species formed in this system. This information should subject thorough verification, when regarding the preparation of the appropriate solutions; e.g., Ce(SO4)2∙4H2O is dissolved in H2SO4 solution, not in water. for elements with positive oxidation numbers, k ∈ 3,…,K. In this notation, fk will be essentially treated not as the algebraic expression on the left side of the equation fk = 0, but as an equation that can be expressed in alternative forms presented above. The relation (5a), where only one species is involved, is considered as equality, not equation. where oxidized forms of Fe and reduced forms of Ce are interrelated; molar concentrations: C02 and C are not involved there explicitly. Concentrations of some species are interrelated in the set of independent expressions, where numerical values for the corresponding equilibrium constants are involved, and applied in the related algorithms. The results of simulated titrations, with measurable values: potential E and/or pH of the D+T system, are plotted as the functions E = E(V) and/or pH = pH(V). In some instances, it is more advantageous/reasonable to plot the graphs: E = E(Φ) and/or pH = pH(Φ), with the fraction titrated [25-28]. on the abscissa, where C0 – concentration [mol/L] of the analyte A in D, C – concentration [mol/L] of reagent B in T; V0 mL is the volume of D taken for titration, V is the current/total volume of T added into D from the start up to a given point/moment of the titration. The Φ provides a kind of uniformity/normalization of the related plots, i.e., independency on V0 value. The fraction titrated Φ (eq. 28) will be applied first to formulate the Generalized Equivalent Mass (GEM) concept. equal to the ratio p/q of small natural numbers p and q, Φeq = p/q. This ratio will be formulated on the basis of location of characteristic points on redox titration curves E = E(Φ). This does not mean, however, that we may choose between equations 35a and 35b, to calculate mA. Namely, eq. 35a cannot be applied for the evaluation of mA: Ve is known, but Fe is unknown; calculation of Fe needs prior knowledge of C0 value. However, C0 is unknown before the titration; otherwise, the titration would be purposeless. Also eq. 35b is useless: the ‘round’ Φeq value is known exactly, but Veq is unknown; Ve (not Veq) is determined in visual titrations. The Generalized Equivalence Mass (GEM) concept was formulated (1979) by Michałowski [18,19,21,25], as the counterproposal to earlier (1978) IUPAC decision , see also . The calculations in GATES/GEB are realized according to iterative computer program. The exemplary computer program, related to the System I, is as follows. No changes in slope on the pH = pH(Φ) curves occur at Φeq = 0.2 (Fig. 1b), although one would expect, at first glance, that MnO4-1 may act, especially in reaction 39, like 'octopus' swallowing H+1 at Φ < 0.2, while the reaction 39 does not occur at Φ > 0.2. High value of the dynamic buffer capacity [32-34] in the D+T system is responsible for suppressing this effect. Analogous remark is related to the System III, represented by E = E(Φ) and pH = pH(Φ) relationships (Fig. 2), and speciation curves (Fig. 4). Fig. 1. The (1a) E = E(Φ) and (1b) pH = pH(Φ) curves plotted for the System I at V0 = 100, (C02­,V0,C) = (0.01,100, 0.02) and different C04 values [mol/L], indicated in Figures 1b, 1c and 1d (in enlarged scales), before and after Φeq = 0.2; C2=C05=0. Fig. 2. The (2a) E = E(Φ) and (2b) pH = pH(Φ) curves plotted for the System III at V0 = 100, (C02­,V0,C,C1) = (0.01,100, 0.1,1.0) and different C04 values [mol/L], indicated in Figures 2b, 2c and 2d (in enlarged scales), before and after Φeq = 1.0; C2=C05=0. Fig. 3. Dynamic speciation diagrams for (3a) Fe-species, (3b) Mn-species in the System I ; (C02,C,C04) = (0.01,0.02,1.0), C2=C05=0, V0=100. where ϑ = a∙ln10 is the real slope of indicator electrode; and values are assumed constant during the titration; the involves standard redox potential E0 for reaction 41, potential of reference electrode, and liquid junction potential. Fig.4. Dynamic speciation diagrams for (4a) Fe-species, (4b) Ce-species in the System III; (C,C1,C02,C04) = (0.1,0.5,0.02,1.0), C2=C05=0, V0=100. The latter one is identical with eq. 4c. valid for V < Veq. Equations 53a and 55 are the basis for the modified Gran II method in its accurate version, denoted in [ACA606] as MG(II)A, which improves the results dramatically. Moreover, the error z of analysis is not affected significantly by the true ϑ value for the slope of an indicator electrode. Fig. 5. The q = ln(b3/b2) vs. F relationships for the Systems: I (5a), at (C,C02) = (0.02,0.01), and III (5b), plotted at (C,C1,C02) = (0.1,0.5,0.01), V0=100, C2=C05=0, and different C04 values indicated at the corresponding curves. Fig. 6. Comparison of the plots for: (1) f1(x) = ln(1+x), (2) f2(x) = and (3) f3(x) = x, x ∈ < 0, 1 > . in equations 68, 69; N – number of exp. points (Vj,Ej) | j=1,…,N. The formulation applied here is the basis for the modified G(I) method in its simplified version, denoted as MG(I)S version . The great advantage of MG(I)S over G(I) method results from application of formulas 59 instead of approximation ln(1±x) ≈ ± x inherent in the G(I) method, see Fig. 6.
are put at Vj* (eq. 61). Then the Jj = J(Vj) values were calculated from the formula 72a. 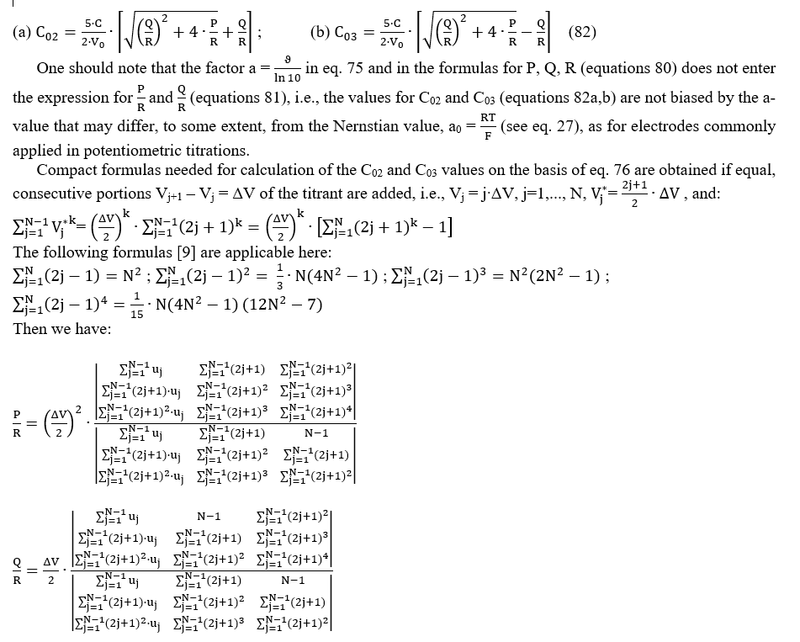 The formulas presented here are the basis for the MG(II)B method . An alternative is here the MG(II)C method , based on the Lagrange polynomial interpolation method. The interrelations between G(I), G(II) and different modifications of these methods are collected in . Referring to the System II, one can state/assume that the composition of the titrand D can be affected here by partial oxidation of the iron(+2) species by oxygen from air, as in the case of natural waters. Calibration of redox indicator electrodes (RIEs) is of primary importance in potentiometric measurements performed in redox systems. The difficulties in calibration of RIEs were probably the main reason for generating the opinion on inapplicability of the Gran II (G(II)) method for determination of equivalence volume (Veq) in redox titrations. This problem has been exposed , where inaccuracy of the results obtained according to G(II) method at greater discrepancies between true (correct, J) and pre-assumed (Jc) slope values, |Jc – J| for RIEs has been proved . It was also stated that the error in Veq can be substantially decreased, even at greater |Jc – J| values, if the modified Gran II method in its accurate version (MG(II)A) proposed in  is applied; the MG(II)A method improves the results dramatically (Fig. 7). The error z is not affected significantly by the true ϑ-value of an indicator electrode. Fig. 7. 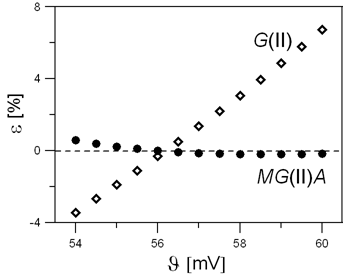 The relationships between relative error e [%] in Veq determination vs J [mV] plotted for G(II) and MG(II)A methods, at Jc = 56 mV value pre-assumed in calculations . It is stated that the linearizing approaches, inherent in original G(I) and G(II) methods, may provide inaccurate results of analyses. It were stated that the original Gran methods, particularly G(I) method , do not provide accurate results for Veq; the errors involved in G(I) may exceed tens percents, as indicated in . Far more accurate results of analysis are obtainable according to the modified methods proposed by Michałowski in a series of papers [9-12,25], after recalling to the physicochemical nature of the system tested. Also the original G(II)  method may not provide accurate results in the titrations; the matter lies in the divergence (ranging several percents ) between true and Nernstian slopes of the indicator electrode and in some difficulties encountered in calibration of this electrode. In contradistinction to the G(II) method, the G(I) method offers the possibility to perform the potentiometric titrations without prior knowledge of ϑ – provided that ϑ is constant within defined V-range covered in the Gran methods, where the validity of assumption ϑ = ϑ(V) = const is increased – in contradistinction to the methods based on the inflection point location; a dramatic change of the analyte concentration occurs in the vicinity of this point. Such advantages of G(I) method were successfully exploited in the modified G(I) methods [9-12,25], thereafter referred to as simplified (MG(I)S) and accurate (MG(I)A) methods . 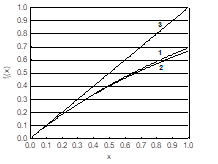 The results of calculations related to redox systems were obtained according to GATES/GEB principles, with use of the iterative computer program MATLAB and the generator of pseudo-random numbers ; these results were confirmed experimentally in [10,11]. The Generalized approach to electrolytic systems (GATES)  with the generalized electron balance (GEB) involved as GATES/GEB, is adaptable for resolution of thermodynamic (equilibrium and metastable) redox systems of any degree of complexity; none simplifying assumptions are needed . Application of GATES provides the reference levels for real analytical systems, where some effects involved with kinetics and transportation (diffusion) phenomena occurred at the electrodes. The GATES makes possible to exhibit some important details, of qualitative and quantitative nature, invisible in real experiment, e.g. speciation. Reliability of physicochemical data (standard potentials, equilibrium constants of complexes, etc.) values is needed for this purpose. This requirement is fulfilled, among others, for 1◦ manganometric and 2◦ cerometric titrations of ferrous ions, where equilibria are established rapidly in the bulk solution. This way, we provide an approach to a more general problem involved with optimization a priori in redox systems, realized according to GATES principle. The GATES approach is based on mathematical foundations, expressed by a system of nonlinear algebraic equations, not on a “fragile” chemical reaction notation, based on stoichiometry. Within GATES, the stoichiometry concept, as a resultant of all particular (stoichiometric, in principle) chemical reactions occurred in a dynamic system (as titration is) is not applied. Among others, the generalized equivalence mass (GEM) concept, based on GATES, is not involved with the stoichiometry concept. The stoichiometry is only a redundant concept within GATES and then formulation of reaction notation can be considered only as a kind of intellectual/didactic occupation, that can be made after presentation of the related curves obtained from calculations based on GATES. The GEB (as Approaches I and II to GEB), GATES, GEM and all modifications of the Gran methods were discovered/suggested/formulated by Michałowski [9-12,25], and extended on different acid-base systems, involved also with total alkalinity [28,36,37], also with fulvic acids involved , and carbonate alkalinity , in particular. Gran, G. (1950) Determination of the equivalence point in potentiometric titration, Acta Chemica Scandinavica 4 559-577. .
Gran, G. (1988) Equivalence volumes in potentiometric titrations, Analytica Chimica Acta 206: 111-123. 80835-1 ; https://www.sciencedirect.com/science/article/pii/S0003267000808351. Gran, G. (1952) Determination of the equivalence point in potentiometric titrations. Part II, Analyst 77 661-671. .
Johansson, A., Gran, G. (1980) Automatic titration by stepwise addition of equal volumes of titrant. Part V. Analyst, 105: 802-810.
da Conceição Silva Barreto, M., de Lucena Medeiros, L., César de Holanda Furtado, P. (2001) Indirect Potentiometric Titration of Fe(II) with Ce(IV) by Gran’s Method, Journal of Chemical Education 78: 91-92. MacDonald, T.J., Barker, B.J., Caruso, J.A. (1972) Computer evaluation of titrations by Gran’s method. An analyti-cal chemistry experiment, Journal of Chemical Education, 49(3): 200-201. Maccà, C., Bombi, G.G. (1989) Linearity range of Gran plots for the end-point in potentiometric titrations, Analyst, 114: 463-470. Maccà, C. (1989) Linearity range of Gran plots from logarithmic diagrams, Analyst, 114: 689-694. Michałowski, T., Baterowicz, A., Madej, A., Kochana, J. (2001) An extended Gran method and its applicability for simultaneous determination of Fe(II) and Fe(III), Analytica Chimica Acta 442(2): 287-293. .
Michałowski, T., Kupiec, K., Rymanowski, M. (2008). Numerical analysis of the Gran methods. A comparative study, Analytica Chimica Acta 606(2): 172-183. http://suw.biblos.pk.edu.pl/resourceDetails&rId=4745%7D%7D%3C/opinion&rId=24153. Ponikvar, M., Michałowski, T., Kupiec, K., Wybraniec, S., Rymanowski, M. (2008). Experimental verification of the modified Gran methods applicable to redox systems, Analytica Chimica Acta 628(2): 181-189. .
Michałowski, T., Toporek, M., Rymanowski, M. (2005) Overview on the Gran and other linearization methods applied in titrimetric analyses, Talanta 65(5): 1241-1253. .
Michałowski, T., Toporek, M., Michałowska-Kaczmarczyk, A.M., Asuero, A.G. (2013) New Trends in Studies on Electrolytic Redox Systems. Electrochimica Acta 109: 519–531. Michałowski, T., Michałowska-Kaczmarczyk, A.M., Toporek, M. (2013) Formulation of general criterion distin-guishing between non-redox and redox systems, Electrochimica Acta 112: 199-211. .
Michałowska-Kaczmarczyk, A.M., Toporek, M., Michałowski, T. (2015) Speciation Diagrams in Dynamic Iodide + Dichromate System, Electrochimica Acta 155: 217–227. Toporek, M., Michałowska-Kaczmarczyk, A.M., Michałowski, T. (2015) Symproportionation versus isproportionation in Bromine Redox Systems, Electrochimica Acta 171: 176–187. Michałowska-Kaczmarczyk, A.M., Asuero, A.G., Toporek, M., Michałowski, T. (2015) “Why not stoichiometry” versus “Stoichiometry – why not?” Part II. GATES in context with redox systems, Critical Reviews in Analytical Chemis-try 45(3): 240–268. Michałowska-Kaczmarczyk, A.M., Michałowski, T., Toporek, M., Asuero, A.G. (2015) “Why not stoichiometry” versus “Stoichiometry – why not?” Part III, Extension of GATES/GEB on Complex Dynamic Redox Systems, Critical Reviews in Analytical Chemistry, 45(4): 348-366. Michałowski T. (1981) Some remarks on acid-base titration curves, Chemia Analityczna 26: 799-813. Michałowski, T. (2010) The Generalized Approach to Electrolytic Systems: I. Physicochemical and Analytical Im-plications, Critical Reviews in Analytical Chemistry, 40: 2-16. Michałowski, T., Pietrzyk, A., Ponikvar-Svet, M., Rymanowski, M. (2010) The Generalized Approach to Electrolyt-ic Systems: II. The Generalized Equivalent Mass (GEM) Concept, Critical Reviews in Analytical Chemistry 40: 17-29. Zhao, M., Lu, I. (1994) abolition of the equivalent. Rule of equal amount of substance. Analytica Chimica Acta 289(1): 121–124. Michałowski, T., Wajda, N., Janecki, D. (1996) A Unified Quantitative Approach to Electrolytic Systems, Chemia Analityczna (Warsaw), 41: 667-685. .
Michałowska-Kaczmarczyk, A.M., Spórna-Kucab, A., Michałowski, T. (2017) Dynamic Buffer Capacities in Redox Systems, Journal of Chemistry and Applied Chemical Engineering, 1(2): 1 - 7 . . http://biochem-molbio.imedpub.com/dynamic-buffer-capacities-in-redox-systems.pdf. Michałowska-Kaczmarczyk, A.M., Michałowski, T. (2015) Dynamic Buffer Capacity in Acid-Base Systems, Jour-nal of Solution Chemistry, 44: 1256–1266. .
Michałowska-Kaczmarczyk, A.M., Michałowski, T., Asuero, A.G. (2015) Formulation of dynamic buffer capacity for phytic acid, American Journal of Chemistry and Applications 2(1): 5-9. Michałowski, T., Stępak, R. (1985) Evaluation of the equivalence point in potentiometric titrations with application to traces of chloride, Analytica Chimica Acta, 172: 207-214. MATLAB Function Reference, Version 7.0, The MathWorks Inc., . Michałowski, T., Asuero, A.G. (2012) New approaches in modelling the carbonate alkalinity and total alkalinity, Critical Reviews in Analytical Chemistry, 42: 220-244. Michałowska-Kaczmarczyk, A.M., Spórna-Kucab, A., Michałowski, T., Asuero, A.G. (2018) The Simms constants as parameters in hyperbolic functions related to acid-base titration curves, Journal of Chemistry and Applied Chemical Engineering, 2(2): 1-5. Michałowska-Kaczmarczyk, A.M., Michałowski, T. (2016) Application of Simms Constants in Modeling the Ti-trimetric Analyses of Fulvic Acids and Their Complexes with Metal Ions, Journal of Solution Chemistry 45: 200–220. Pilarski, B., Michałowska-Kaczmarczyk, A.M., Asuero, A.G., Dobkowska, A., Lewandowska, M., Michałowski, T. (2014) A New Approach to Carbonate Alkalinity, Journal of Analytical Sciences, Methods and Instrumentation 4: 62-69.